How to prepare your farm and animals for winter! 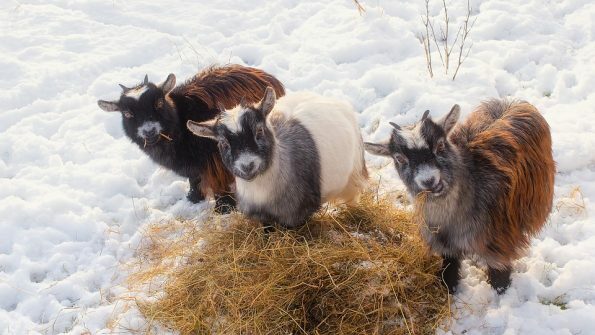 Home » How to prepare your farm and animals for winter! It’s that time of year again, snow and slick ice are back! This is a great time to check over your animal facilities and make sure you can have the best environment for your animals during the winter months. When prepping your animals for winter there are three general concepts that I like to focus on. Anyone remember last year when we had quite a number of freezing days. In order to ensure your animals have adequate access to water, please check your troughs daily and break the ice layer if needed. Even a day without water can lead to horse colic or other dehydration issues in all species. There are heated water buckets available at most farm stores that can help with this but electricity is usually needed. If your animal does not like to drink cold water sometimes offering luke warm water can really increase their intake! Also always make sure fresh, clean water is available as animals will sometimes refuse to drink heavily contaminated water. A clean trough is a healthy trough! Check where your water troughs are located, sometimes animals will not want to leave their shelter or walk across a frozen or muddy patch of ground to get to the water trough. Older, arthritic animals may also have trouble moving around in the cold, so easy access is essential. Competition is also important to think about, make sure your boss animals aren’t hogging the water trough and keeping others from getting adequate intake. Just like you and I, animals have a physical limit of how much food they can eat in a day. Add on the added requirements to heat your body in the cold temperatures and your feed intake needs to go up. So if you are only feeding low quality hay, this is where supplements can come in and make a nice impact in caloric intake to keep weight on if hay alone will not suffice during the winter. So, fresh and easy access to clean, dry feed is essential in winter. Please be cautious of feeding wet or moldy feed as this can be detrimental to the health of your animal. The body condition of your animal will always tell you if your animal is too heavy or needs better conditioning. KVH doctors are happy to assist you with determining the body condition score of your animal at your next appointment in order to make adjustments to feeding! Imagine if you had to spend a night outside tonight in a snow flurry. Not ideal, but our animals have to live their entire lives outside. So building and maintaining a comfortable shelter is essential for animal comfort. Keep these in mind when looking at your animal’s shelter… Is it dry, warm, insulated? Is their shelter from the wind and rain/snow. How is the ventilation? I like to encourage people to get down to the animals level in the shelter and make sure it isn’t hard to breathe from ammonia or other noxious smells. If it hurts you to breathe, imagine what your animal feels. Cross ventilation is very helpful with this as well as changing the animals bedding frequently. Heat lamps: typically only needed for newborns as adults should be able to regulate their body temperature and keep warm. The heat lamp is best positioned 21 inches away from the animal. Please keep away from flammable material and secure the lamp well to prevent falling. Never rest heat lamps near straw, bedding, wood, or too close to the animal as they can and will cause fires or burns! SECURE, SECURE, SECURE, THE HEAT LAMP, please. The ground environment is very important also. Secure footing is essential. The last thing you want is your animal to slip on the ice. So, look for ways to provide adequate footing such as mats, straw, or other materials. And limit the amount of mud your animal must stand in as foot issues can arise from excessive moisture. I know a lot of people think that keeping your animal only in their shelter during the cold is ideal; however, imagine being trapped in a closet all day without being able to leave. Your animal will need exercise and want to stretch. Allowing them to still go out into their environment will promote good mental health for your animal. The caveat to this is if there is freezing rain, we wouldn’t want your animal to slip and fall and injure themselves. Use your best judgment! Winter is a tough time for many animals, but ensuring you have done a great job prepping the animal’s environment will make it more comfortable and safer for everyone. The doctors here at KVH are always happy to help you with questions or to visit your house to inspect the environment to make sure all your animals are happy and healthy. Merry Christmas and a Happy New Year to all of our beloved clients and animals! Normal Large Animal service ends at 1:00 pm on Saturdays. After hours Large Animal emergency service is available by calling our same phone number. After hours Small Animal service is available through Animal Emergency Care at 4176 Meridian St, Bellingham. Their phone number is 360-758-2200.